This small shrine is one of many surrounding the main stupa at Swayambhunath. Nepalese Buddhism is mainly Vajrayana and the stupa of Swayambhunath is Nepal's most revered Buddhist temple, and one of the most sacred Buddhist sites in the world. 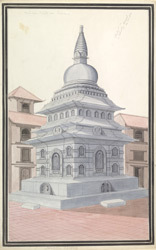 The stupa was founded in the 5th century AD, yet many believe it is much older. A long stairway leads up to the eastern side of the stupa and at its head is a huge copper gilt vajra (thunderbolt), placed on top of a stone mandala (cosmic plan). The vajra was originally an attribute of Indra, the Vedic supreme ruler of the Gods. In Vajrayana or Tantric Buddhism, the thunderbolt has assumed a powerful symbolism, of indestructibility and purity as strong as a diamond, and of the flash of intuition or potent awakening of knowledge. It is a frequent motif in Nepalese art.